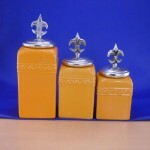 CERAMIC LARGE YELLOW CANISTER SET W / SILVER GRAPE LIDS .. 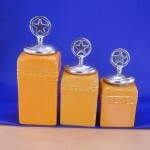 CERAMIC LARGE MUSTARD CANISTER SET W / COPPER STAR LIDS LARGE SIZE CANISTER- 6.5" .. 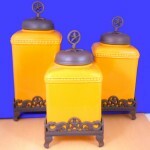 CERAMIC LARGE YELLOW CANISTER SET W / COPPER GRAPE LIDS LARGE SIZE CANISTER- 6.5" .. CERAMIC LARGE YELLOW CANISTER SET W / SILVER STAR LIDS LARGE SIZE CANISTER- 6.5" S.. 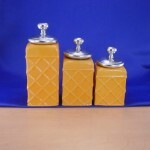 CERAMIC LARGE YELLOW CANISTER SET W / COPPER FDL LIDS LARGE SIZE CANISTER- 6.5" SQ.. 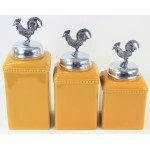 CERAMIC LARGE YELLOW CANISTER SET W / SILVER ROOSTER LIDS LARGE SIZE CANISTER- 6.5.. CERAMIC LARGE YELLOW CANISTER SET W / SILVER FDL LIDS LARGE SIZE CANISTER- 6.5" SQ.. CERAMIC LARGE MUSTARD CANISTER SET W / PLAIN KNOB LIDS LARGE SIZE CANISTER- 6.5" S.. CERAMIC LARGE BROWN CANISTER SET W / FDL COPPER LIDS & BASE LARGE- 7.5"L X 7.5.. 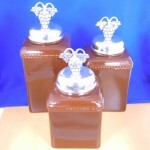 CERAMIC LARGE BROWN CANISTER SET W / GRAPE COPPER LIDS & BASE LARGE- 7.5"L X 7.. 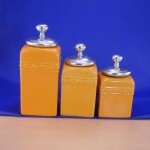 CERAMIC LARGE RYELLOW CANISTER SET W / FDL COPPER LIDS LARGE- 7.5"L X 7.5"W X 18"H.. CERAMIC LARGE YELLOW CANISTER SET W / GRAPE COPPER LIDS LARGE- 7.5"L X 7.5"W X 18".. 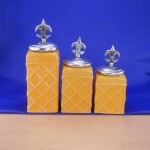 CERAMIC LARGE MUSTARD CANISTER SET W / STAR COPPER LIDS & BASE LARGE- 7.5"L X .. 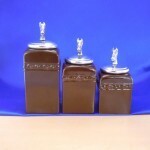 CERAMIC LARGE BROWN CANISTER SET W / SILVER FDL LIDS LARGE SIZE CANISTER- 6.5" SQU..
3PC. 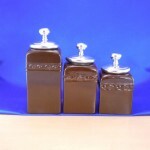 CERAMIC LARGE BROWN CANISTER SET W / PLAIN KNOB LIDS LARGE SIZE CANISTER- 6.5.. 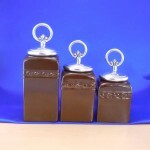 CERAMIC LARGE BROWN CANISTER SET W / SILVER GRAPE LIDS Size: ONE .. 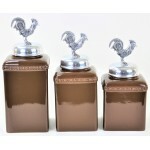 CERAMIC LARGE BROWN CANISTER SET W / SILVER ROOSTER LIDS LARGE SIZE CANISTER- 6.5".. 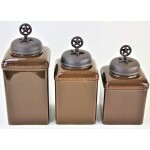 CERAMIC LARGE BROWN CANISTER SET W / COPPER FDL LIDS LARGE SIZE CANISTER- 6.5" SQU.. 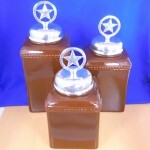 CERAMIC LARGE BROWN CANISTER SET W / SILVER STAR LIDS Size: ONE .. CERAMIC LARGE BROWN CANISTER SET W / COPPER GRAPE LIDS LARGE SIZE CANISTER- 6.5" S.. CERAMIC LARGE BROWN CANISTER SET W / COPPER STAR LIDS LARGE SIZE CANISTER- 6.5" SQ.. 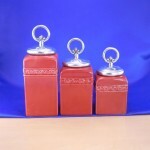 CERAMIC CANISTER SET ROPE RED W/ FDL COPPER LIDS .. 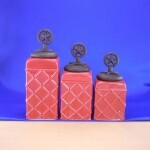 CERAMIC CANISTER SET ROPE RED W/ STAR COPPER LIDS .. 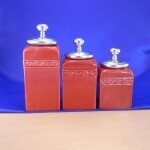 CERAMIC CANISTER SET ROPE RED W/ SILVER PLAIN KNOB LIDS .. 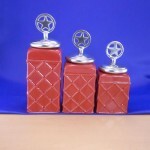 CERAMIC CANISTER SET ROPE RED W/ STAR SILVER LIDS .. 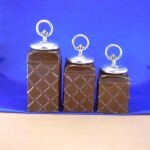 CERAMIC CANISTER SET ROPE RING W/ FDL SILVER LIDS .. 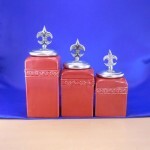 CERAMIC CANISTER SET ROPE RED W/ FDL SILVER LIDS .. 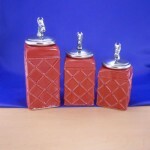 CERAMIC CANISTER SET ROPE RED W/ HORSE SILVER LIDS .. 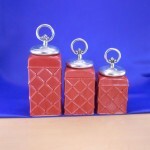 CERAMIC CANISTER SET ROPE RING RED W/ FDL SILVER LIDS .. 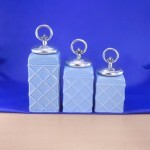 CERAMIC CANISTER SET ROPE BLUE W/ FDL SILVER LIDS .. CERAMIC CANISTER SET ROPE BLUE W/ HORSE SILVER LIDS .. 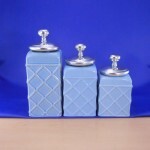 CERAMIC CANISTER SET ROPE BLUE W/ PLAIN KNOB SILVER LIDS .. 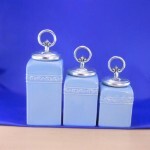 CERAMIC CANISTER SET ROPE BLUE W/ RING SILVER LIDS .. 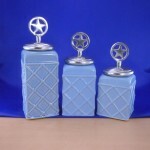 CERAMIC CANISTER SET ROPE BLUE W/ STAR SILVER LIDS .. 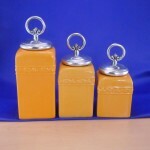 CERAMIC CANISTER SET ROPE YELLOW W/ FDL SILVER LIDS .. 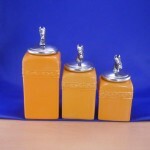 CERAMIC CANISTER SET ROPE YELLOW W/ HORSE SILVER LIDS .. CERAMIC CANISTER SET ROPE YELLOW W/ PLAIN KNOB SILVER LIDS .. 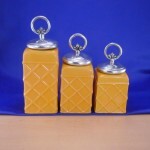 CERAMIC CANISTER SET ROPE YELLOW W/ RING SILVER LIDS .. 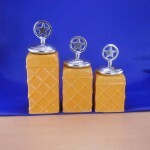 CERAMIC CANISTER SET ROPE YELLOW W/ STAR SILVER LIDS .. 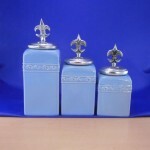 CERAMIC CANISTER SET BLUE W/ FDL SILVER LIDS .. 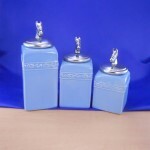 CERAMIC CANISTER SET BLUE W/ HORSE SILVER LIDS .. CERAMIC CANISTER SET BLUE W/ PLAIN KNOB SILVER LIDS .. 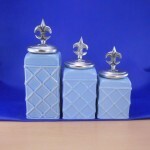 CERAMIC CANISTER SET BLUE W/ RING SILVER LIDS .. 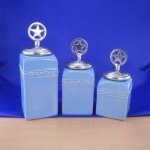 CERAMIC CANISTER SET BLUE W/ STAR SILVER LIDS .. 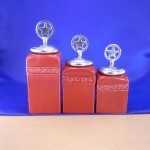 CERAMIC CANISTER SET RED W / STAR SILVER LIDS .. 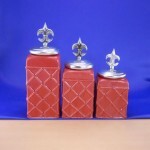 CERAMIC CANISTER SET RED W/ FDL SILVER LIDS .. 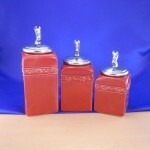 CERAMIC CANISTER SET RED W/ HORSE SILVER LIDS .. 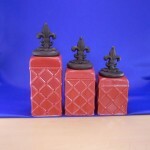 CERAMIC CANISTER SET RED W/ PLAIN KNOB SILVER LIDS .. 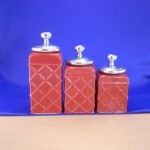 CERAMIC CANISTER SET RED W/ RING SILVER LIDS .. 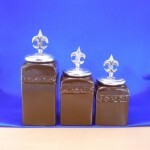 CERAMIC CANISTER SET BROWN W/ FDL SILVER LIDS .. 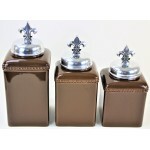 CERAMIC CANISTER SET BROWN W/ HORSE SILVER LIDS .. 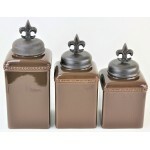 CERAMIC CANISTER SET BROWN W/ PLAIN KNOB SILVER LIDS .. 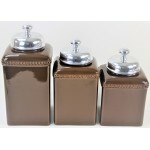 CERAMIC CANISTER SET BROWN W/ RING SILVER LIDS .. 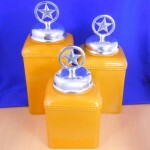 CERAMIC CANISTER SET YELLOW W / STAR SILVER LIDS .. 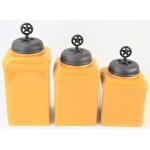 CERAMIC CANISTER SET YELLOW W/ FDL SILVER LIDS .. CERAMIC CANISTER SET YELLOW W/ HORSE SILVER LIDS .. CERAMIC CANISTER SET YELLOW W/ PLAIN KNOB SILVER LIDS .. 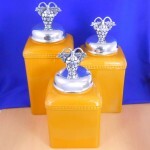 CERAMIC CANISTER SET YELLOW W/ RING SILVER LIDS ..